Kitty litter can be one of the most annoying things for a cat owner. It never stays in the box and will track all over the house. In fact, you may be tempted to think that the cat just likes to grab the stuff and spread them all over the floor just to get to you. If you have been having such problems with your kitties, here are ten simple solutions to keep the litter out of your floors, rugs and in the litter box. One of the best ways to keep the litter at bay is to constantly vacuum and clean the area around the litter box. For non-clumping litter uses a solid spoon to get out the most urine soaked areas. If you use clumping litter, scoop out the litter box twice a day to remove liquid and solid clumps. Contain the box with something like a kiddie pool or if you have a spare bathroom, place the litter box in the shower stall or tub. Something like a storage tub with high sides and an entry hole will ensure that the litter is off the cat’s paws by the time he climbs out. Note that this technique may not work with arthritic or older cats that may have a hard time getting into such litter boxes. The location of the litter box can make a lot of difference in how much kitty litter gets tracked into your rugs, bed, and furniture. Gradually move the box away from your bedroom, and living room areas as the cat can be sensitive to changes in the locations of the litter box. Once it is far enough, not much litter will be tracked into your living areas. You may have to try out different sizes and shapes of boxes for your cat. Some of the best litter boxes are square shaped boxes that you can position on the corner. Since cats love to kick towards the corner, much of the litter will not end up on the floor, where it can be tracked into the living room and bedrooms. There are many mats and rugs that are made to specifically prevent kitty litter from tracking. You can get anything from sisal rugs, shaggy bath mats, throw rugs, and rubber mats with grooves, which you can place beneath the litter box or on the path the cat takes when leaving the box. Have your mats been approximately two feet from the litter box so that the cat will not leap over it. Some litters are prone to tracking more than others and switching litters may be just what you need. Overall, lightweight and small particle litters made of a material such as pine are most prone to tracking. By going for heavier and coarser litter such as clay which clumps more, you can reduce the tracking by a significant margin. 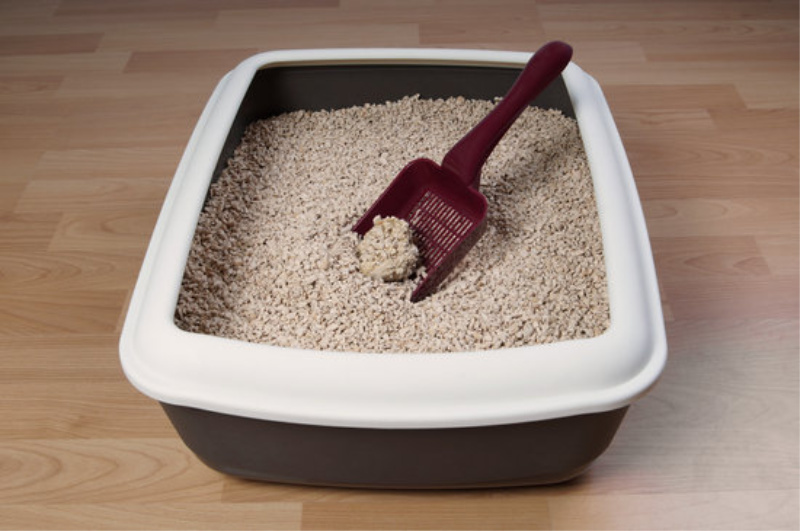 One of the most effective ways of keeping track at bay is with a top entry litter box. The boxes have a grate and textured top, which removes most of the litter from the cat’s paws as they attempt to exit. Moreover, these types of boxes are easy to carry around and provide the utmost privacy for the cat. Keep a broom and vacuum handy near the litter box and clean the area around it frequently. Do several sweeps of the area several times a day to clean up any tracking litter so that it does not get into the living quarters. One of the best ways to keep the area litter free is to get an electric roller vacuum. If the litter you are using does not clump as fast as it should, the pets will be walking on wet litter. Wet litter clings to their paws more and will end up tracking on your rugs and floors when they get out. With quick-clumping litter, a lot more of the litter will stay inside the litter box. If you have tried everything but nothing seems to work, you should consider toilet training the cat. If you have special training equipment such as training seats, it should only take a few weeks before the cat can use the toilet and you can get rid of the litter box. Cat litter tracking is a problem that has afflicted kitty owners ever since the cat litter box was invented. However, you do not need to suffer from kitty litter on your rugs, beds, and furniture. Following these tips should keep as much of the tracking at bay. If all fails, you can always toilet train the cat.